Fun fact: Thursday was the peak of summer! On average, July 19th is the hottest day of the year at Newark Airport (normal high 86.3, normal low 69.1). It's all downhill from now through mid-January! Although we'll enjoy another stellar weather day for Friday, our weather forecast overall will take a giant leap downhill this weekend too. A nasty little coastal storm system is set to deliver wind-driven rain to the Garden State, and we'll see a daily chance of scattered showers (at least) for the foreseeable future. Friday will be our third day in a row of pleasantly warm, non-humid, dry weather. We'll enjoy sunshine and 60s in the morning, with partly sunny skies and highs mainly in the lower 80s in the afternoon. The Jersey Shore also looks good, with air temperatures in the upper 70s, water temperatures averaging lower 70s, and waves building from 2 to 3 feet. Our weather stays quiet for Friday night, although cloud cover will continue to increase. Low temperatures should be comfortable in the lower to mid 60s. Even Saturday morning will be dry, although mostly cloudy to overcast. Temperatures will be stuck in the mid 70s (at best) all day Saturday, with an easterly (on-shore) wind. And then our nasty little storm system arrives. I think it's important to state that, although this coastal storm will tap into some tropical moisture to produce heavy rain, it is not a tropical system or hurricane. (It's more reminiscent of a wintertime nor'easter, really.) Since my admittedly wishy-washy Thursday morning blog post, the forecast has taken a turn toward a worst-case scenario for the Garden State, with a direct hit expected. That means wind-driven rain is expected to make part of the weekend downright nasty. Although there are some timing discrepancies among our forecast models, I think the initial bands of rain will push into South Jersey around midday Saturday. Rain should arrive in North Jersey by about late afternoon Saturday. The consensus forecast puts the heaviest rain over New Jersey from Saturday evening through early Sunday morning. During that period, heavy, steady rain will combine with 30+ mph wind gusts. Rainfall totals will probably top an inch across the state, with the highest totals in excess of 2 to 3 inches. Thunder and lightning are possible, but not a guarantee (given the limited warmth/energy in the atmosphere). The severe weather threat will also be limited, aside from the obvious flash flooding potential. Rain should wrap up Sunday morning, and we might catch a few breaks of sun Sunday afternoon. However, I have to keep a few showers and thunderstorms in the forecast throughout Sunday too. High temperatures should improve to the lower 80s (away from the coast). The rumors about next week are true — we literally have a chance of rain every single day from Saturday through Friday. And that streak may even linger into the first few days of August. The culprit for the extended summer sog-fest is a blocking setup. A strong dome of high pressure will set up to our east, over the Atlantic Ocean, and will serve as an atmospheric "brick wall". That will prevent any storm systems from exiting the U.S. East Coast, and also prevent the overall weather pattern from changing. A strong dome of high pressure to the west will prevent storm systems from backtracking. Sinking air to the left of me. Sinking air to the right. Here I am, stuck in the middle with you. So, as the storm track is stuck directly overhead, we'll have a chance for scattered showers and thunderstorms in the forecast every day next week. I am uncomfortable further pinpointing the geography and timing of this rain, since it's just so volatile — it's going be a day-to-day call. Do I think it's going to rain everywhere every day? Nope. Do I think it's going to rain all-day every day? Nope. You will catch some breaks of dry weather and sunshine along the way, with some summertime heat and humidity. But for those who targeted next week as your week of summer vacation, hoping for beautiful weather... I am truly sorry for having to pass along the wet news. 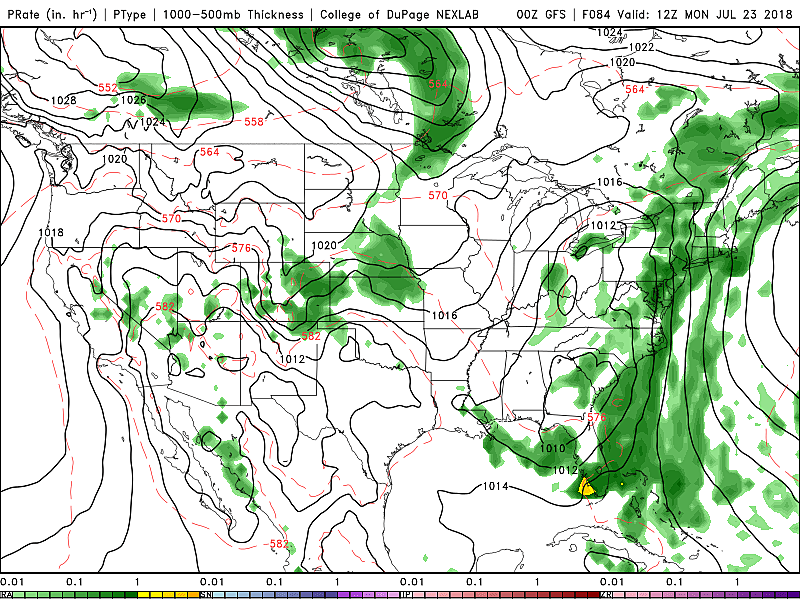 Expect a weather blog update early Saturday morning.